Our plan was to start hiking on Sunday at 9:00 am and we didn't start until 2:00 pm. Not because things went wrong, but mainly because we slept in and found too many last minute concerns to deal with before setting off. Somehow that always happens before a big trip, that's why everyone is always late to airports. Brendan and Tom, two of my best friends, were kind enough to drive us all the way from San Francisco to the border of Mexico (I seriously have the best friends). We piled into the car, made a stop in Santa Barbara to surf and see friends, then made our way to the edge of California. We made it to the trail head. Brendan committed to keeping these flowers alive until we get off the trail.. Hold him to it! Brendan and Tom decided to be legendary once again by hiking our first mile with us. We started hiking and busted out a solid 15 miles on day 1. The desert is super lush this year thanks to El Niño. At least it started out that way. The first two days were overcast and hiking was mellow, we thought for sure we'd get through the desert with ease. Then we hiked up to this pass only to be reassured that we had yet to arrive to the ACTUAL desert. Aaron looking at the ACTUAL desert. Yikes. We have since hiked down this cliff and into the floor of the desert. 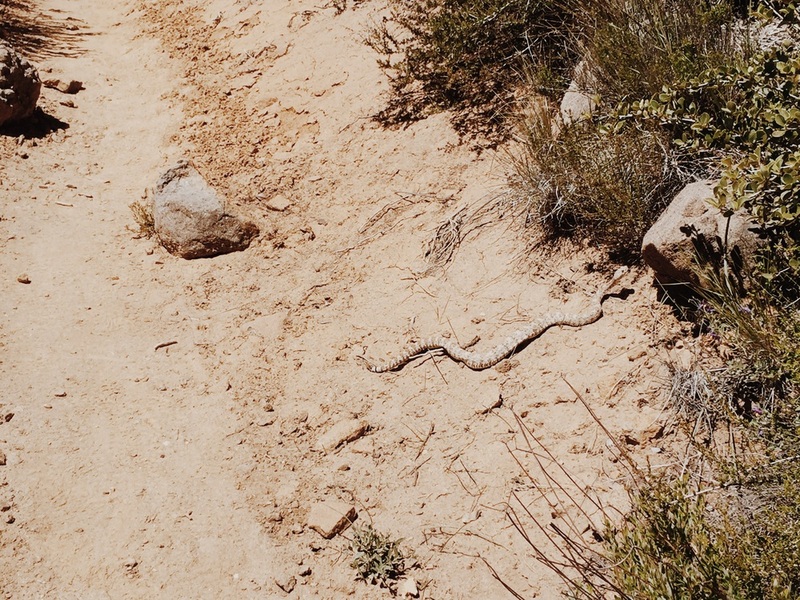 The desert has presented everything you'd typically expect: rattlesnakes, coyotes, cactuses, horned toads, as well as a few things unexpected. Including: blisters, sunburns, sand on EVERYTHING, and endless beauty. That's the basic update. As for the update on what's going on in my head, here it is. No, I haven't found myself yet (not sure if I'm actually looking, more on that later), my thoughts while on the trail have been pretty scattered although it is a goal to focus them and meditate more diligently. Right now, I'm letting the Pacific Crest Trail do its own work on me. For example, time becomes relative. 9 am is no longer when you start working, and 12 pm isn't lunchtime. You wake up usually when the sun rises, you hike, eat all day, hike more, eat all night, sleep. A routine eventually forms, but it is not based on society. Today I went into a restaurant (I'm in a hiker town while writing this) expecting to get a massive lunch, only to realize that it was 10:30 am. I ended up with pancakes because lunch wasn't being served (to my dismay). Although society won't change for you, there's definitely a sense of freedom that comes with being on your own time. The Pacific Crest Trail has also done work on my body, I'm more in touch with what my body needs and wants. Damn, my body needed sunlight and physical exhaustion SO badly. I've gone to sleep every night absolutely wiped and woken up with more energy than I've had since childhood. It feels like summer. Not because I'm in the desert, where summer boasts among every other season, but because of the sense of freedom that comes with summer. It's just a joyful season and I'm wallowing in it. The birds are usually singing by the time the sun rises, best alarm there is. My iPhone is possibly the least important item in my pack. Although it is useful when necessary, I rarely use it, and I have gained life because so. I'm sure there are many other aspects in which I am being affected by the PCT and I will express them as I notice them. For now, I'm letting my bad habits, my societal tendencies fall by the wayside as I hike and making sure to enjoy every second of it. Thanks for reading, back to the wilderness for me.